A beer sparkler is a device that can be optionally added to the equipment used to serve cask ale. Its function is to act like a shower head, agitating and aerating the beer that passes through it, forcing CO2 out of solution, resulting in a beer with a thicker, creamier head and softer mouthfeel. The reduction in CO2, along with this softer mouth feel, can also promote sweetness in the beer and reduce harsh bitterness. Broadly speaking the North of England favours the use of a sparkler whilst the South doesn't. The argument against being that the added stress put on the beer during its journey to glass actually serves to force volatile flavour and aroma compounds out of solution, dulling the hop character and masking the inherent texture on the beer. Being about as Southern as it gets, the recent Twissup to Burton really opened my eyes to the prevalence of sparklers in the North. Instantly beer feels wrong in the mouth, the texture cloaked by a thick slab of silky head, the aroma losing its battle to cling to the liquid ... perhaps. 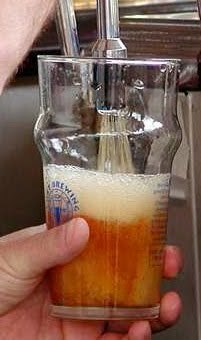 As a home brewer, the beer I make myself always seems to taste better than it should. The measure by which you evaluate beer seems to lose all sense of baseline and perspective when you were integral to the brewing process. Beers that you'd ordinarily turn your nose up at instantly become delicious! The same is clearly true of the sparkler debate. If you grew up with sparkled beers, there's a good chance you'll have a preference for beers served in that way. This is both understandable and completely reasonable, beer should be about enjoyment and if a sparkled head does it for you, go for it .... perhaps. "In the interests of fairness we tried the White Shield, Red Shield and E with and without sparklers, the beer was in such fantastic condition that even without the sparkler it looked and tasted brilliant." (Full blog here). The Draft House in Clapham are running a whole night dedicated to the experiment (16th June - 7pm), an event which looks like a lot of fun and a rare pub-led focus on the debate. Personally I think it's important to remember that the brewer knows how he or she wants the beer to be served. A sparkler might suit specific styles of beer more than others, but ultimately that's irrelevant in comparison to the brewer's intention. As the craftsman of your pint, they know how they intended the beer to be served, it's the barman's responsibility to insure that the beer reaches the drinker in that state. I think that sparkling every beer as a matter of course is the wrong thing to do. Equally though, if the intention was for a thick head and smooth body, under specific instruction, it would be wrong not to apply a sparkler. Nobody would serve a half in a pint glass and nobody would serve bitter on the rocks, so nobody should use a sparkler without the brewers direction. Do you just take a beer as it comes or do you specify whether or not you want it sparkled? Have you grown up with one method and switched for some reason, if so ... why? And before anyone points it out, yes Burton is the North! Interesting piece. I live in York so ordinarily get beer with a sparkler. I may try to recreate the experiment myself though in a few of my locals. Thanks for the mention Chunk (mark?) and I'm glad someone else finds this interesting. I hope we get a decent crowd down for the experiment...spread the word. Well, the sparkler comes from Yorkshire, the same place where they invented the ingenious device for recycling the contents of the slops tray into drinkers' pints. Beer in decent condition doesn't need a sparkler. All it does is make you wait longer before you can start drinking your pint, or disguise that the beer is flat. I don't see either of those things as an advantage. pintsofview: Give it a try, it can't hurt to see what the difference is and which you prefer. I do think it's about the brewer’s instruction though. Charlie: Either works fine. :P Yeah, hopefully it'll be a big crowd, hoping to make it down myself too. Barm: Recycling slops sounds absolutely terrible! Agree that beer in condition doesn't need a sparkler for head ... will still change the smoothness of the body though? I think the difference is between a *frothy* head and a *creamy* head. If you give the pump handle a good yank on the second pull you can obtain a nice head on well-conditioned beer. But the SParkler is, I think, giving you something closer to Guinness than bitter in consistency (to make the point with an extreme and inaccurate analogy). I should add, it's only a bit of fun! ANd partly will be amusing to see Duncan Smabrook's face when Wandle (hopefully) comes out like Boddingtons! Charlie: You're dead right about the difference being "frothy" vs "creamy". Creamy tends to last the length of the glass a bit better too. It'll be interesting to see what happens to the Wandle's flavour with the two different dispenses. Got to admit that I'm not a huge Wandle fan. Rich: Cheers. I'll check out your blog entry about it, must've missed it somehow. Terrific, heart-felt blog from Richard (mate, you've done a few of your events with us at Westbridge I do believe). The obvious question for this esteemed forum is - given that Wandle is the SOuthern pick (being brewed 200 yards away), what would be the best Sparkler-friendly northerner to compare and contrast. Landlord was suggested above. Black Sheep bitter? thanks for the mention mate!! its an interesting thing, ive had timmy taylors with and without sparklers and on gravity cask, the only one that differed was the gravity fed one. I do wonder how much notice a pub takes of what a brewer suggests or if all brewers even bother to suggest with/without a sparkler. No problem! You're probably right that most breweries don’t specify whether a sparkler should or shouldn't be used. My opinion is that unless they specifically state it should be used, it should be left off. A pub ignoring a specific instruction from the brewer can only be a bad thing I think. Chunk - You clearly don't know that much about sparklers do you? I wish I'd come across this before. You are repeating the same old hoary myths about knocking flavours out, making it sweeter etc. Still. Firstly if you pour beer like your photo, it will be shite. For the record you insert the swan neck and sparkler to the bottom of the glass, give two vigorous pulls and then let it settle. Then you top up by the same method with a smoother, gentler pull. Now for the variables. Condition is essential.Flat beer will be made even worse by a sparkler and well conditioned beer will benefit. As for drinking through a tight creamy head? Way to go,but it is a technique too. And all breweries that are featured in the Good Beer Guide specify how they wish their beer to be served.Whether they bare or not is a different matter. Sparklers and cellermanship are dear to my heart. Any time you'd like a discussion on it count me in, but at the end of the day if you like your beer Southern style a(flat and flabby in my opinion)- fine -just don't say that sparkled beer is bad. I have had far more duff pints in the South than in the North. Tandleman: Relax dude, have a homebrew! I don't think there's any need for the aggresive tone of your comment. I do however appreciate that you have strong, passionate views on the subject. All of the reading around sparklers that I did suggested the things I wrote to be true. I didn't simply throw a few comments together without bothering to research it first. If you disagree then fair enough but I think "repeating the same old hoary myths" is a touch unfair. The artifical head a sparkler adds comes down to personal taste for me ... going back to the points I made about what you grow up with. Well conditioned beer benefiting from a sparkler is a matter of personal preference. Interesting point about the Good Beer Guide but that doesn't seem like the place to do it to me. Surely the brewery should be directly communicating with the pub it sells to? As for saying that sparkled beer is bad ... I didn't! I don't think Tandleman's comment was aggressive. If it was, it's my fault for winding him up on the same subject earlier. Aggressive moi? A little forthrightness and passion perhaps. PPS - I've added you to my blogroll.